If you’re moving your website or blog to WordPress, you’ll be looking for as many shortcuts as possible to make the process easy. Unless you’re planning a complete rebuild, there will probably be content you want to move across, like posts and images. This could also be a few static pages or it could be hundreds of blog posts going back years. 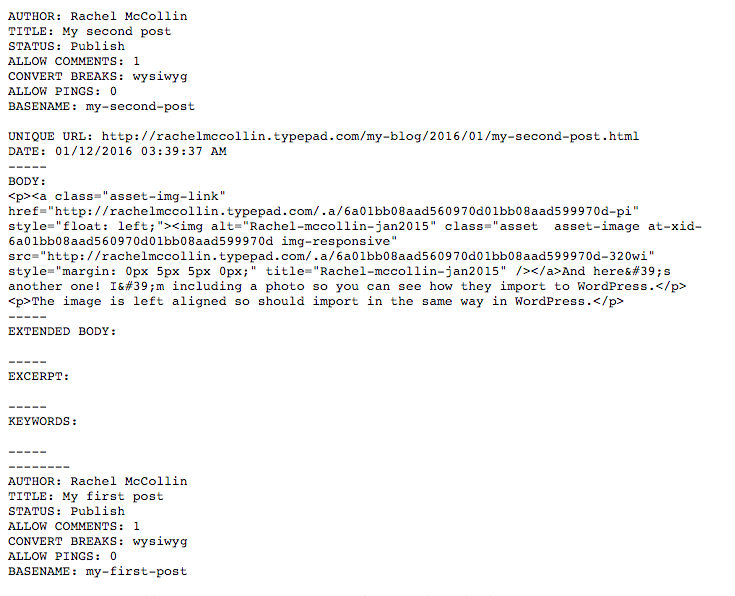 The good news is that WordPress makes it easy to import content from other platforms. 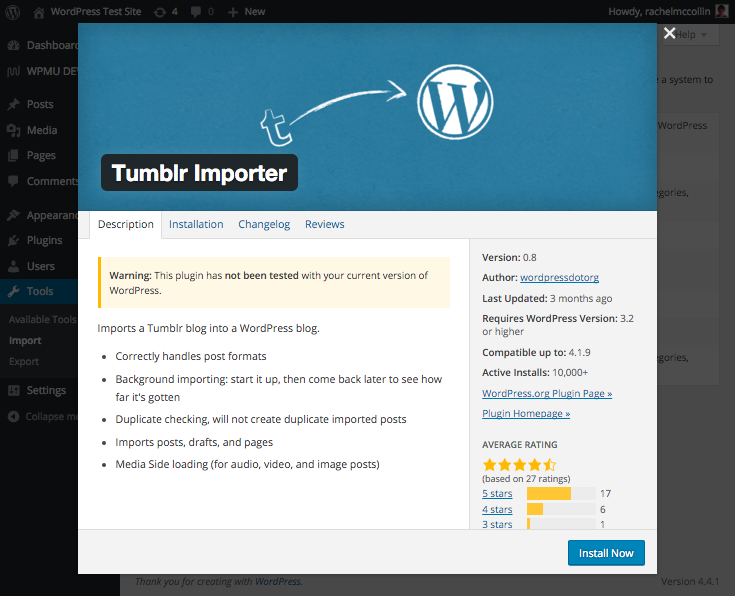 In this post, I’ll show you how to import from the platforms that WordPress provides importer tools for, including Blogger, LiveJournal, TypePad and Movable Type, Tumblr, and even other WordPress sites. The available importers for WordPress. So let’s take a look at how to import content from each of these platforms, and see how close the end results are to the original site. Import the XML file to WordPress suing the importer plugin. Let’s start by doing the export from Blogger. 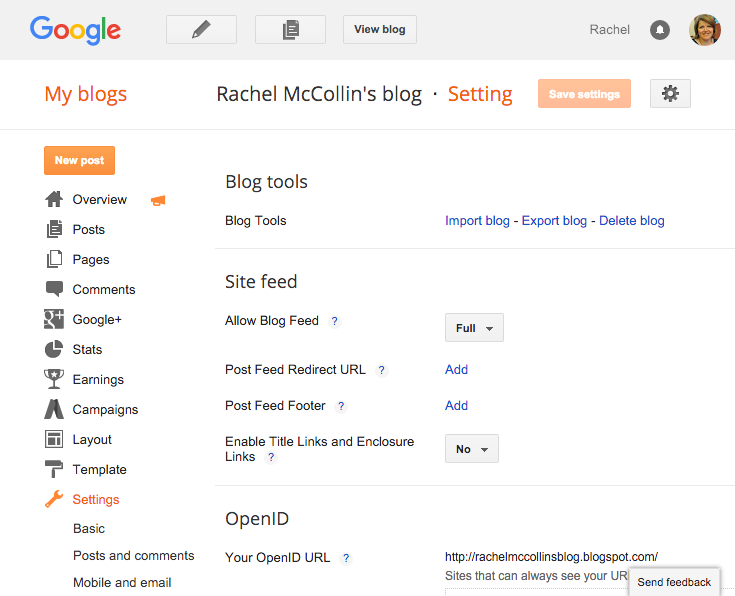 In Blogger, click on Settings > Other in the admin menu on the left. A popup window will appear with information about the export process. Click the Download Blog link. This will download an XML file to your computer. Save it somewhere you can find it again. In WordPress, go to Tools > Import and click on Blogger. Click the Install Now button to install the plugin, then click the Activate Plugin & Rub Importer link to import your Blogger blog. Click the Choose File button and select the XML file you just downloaded from Blogger, then click the Upload file and import button. 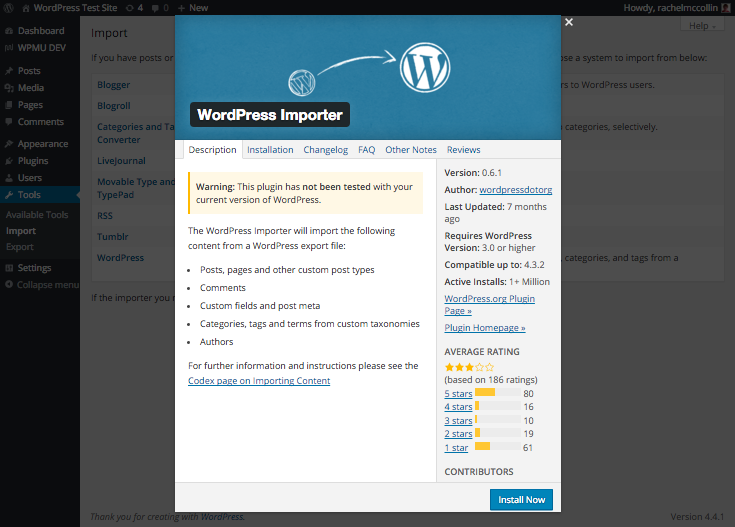 WordPress will import your posts. My Blogger blog now on WordPress. Unfortunately, it hasn’t imported any pages or images, but all of my posts are there. You’ll have to download all of your images from Blogger (or find them on your computer) and re-upload them to WordPress. Next, let’s take a look at importing from LiveJournal. Again, I’ve created a dummy site to export to WordPress. Importing from LiveJournal is a one-step process: instead of uploading an XML file, you input your user credentials when importing, and WordPress uses the LiveJournal API to import your posts. Very easy. Click on Install Now and then once the plugin’s installed, click the Activate Plugin & Run Importer link. You’ll need your LiveJournal credentials in order to copy over your content. 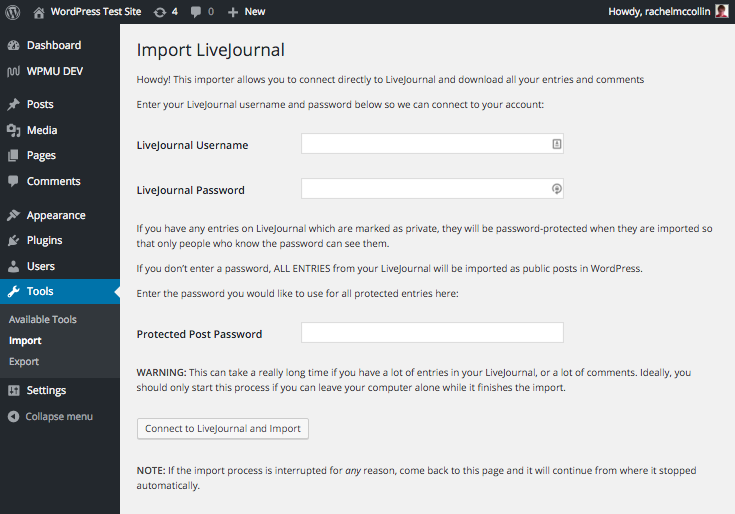 Type in your LiveJournal username and password and click the Connect to LiveJournal and Import button. 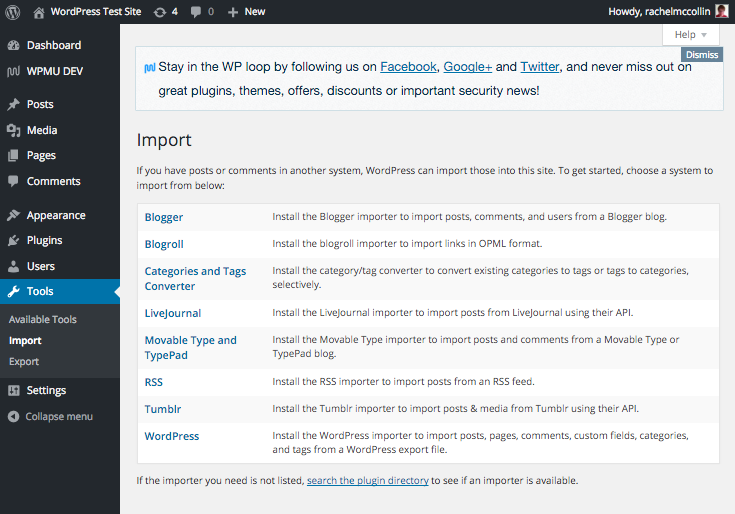 WordPress will import your posts for you. For me, it’s also imported a private post called Welcome to LiveJournal, which won’t be visible to visitors to my blog. My new WordPress site with my LiveJournal content. The importer has imported links to images from the original LiveJournal site, but it hasn’t actually created media files for them. It’s a good idea to have your images stored on your new WordPress site rather than on an old site you no longer maintain, so you’ll need to upload media files to your new site. At the same time, you can fix any issues with image alignment. Let’s start with the export. Click the Export button followed by the Download link. In your browser, save the window as a file (in Chrome, I clicked File > Save Page As…). Save this file somewhere you can find it on your computer – it will be a text file. Note: If you’re exporting from Movable Type, follow the instructions on the Movable Type website to create a download file. Then follow the instructions below. Movable Type and TypePad use the same importer. Click on the Install Now button, then the Activate Plugin & Run Importer link. Click the Choose File button and select the text file you just downloaded from TypePad, then click the Upload file and import button. 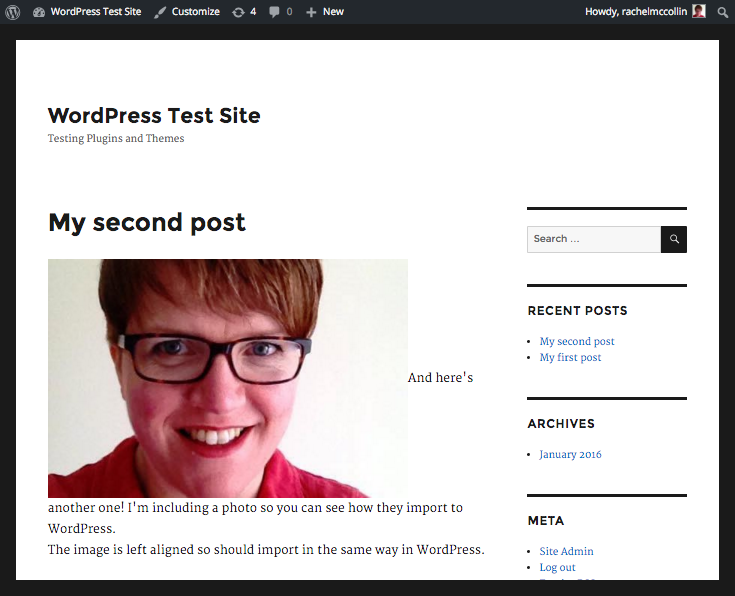 WordPress will ask you whether you want to assign posts from your blog to an existing user on your WordPress site or create a new user. I’ll assign posts to my existing user account. 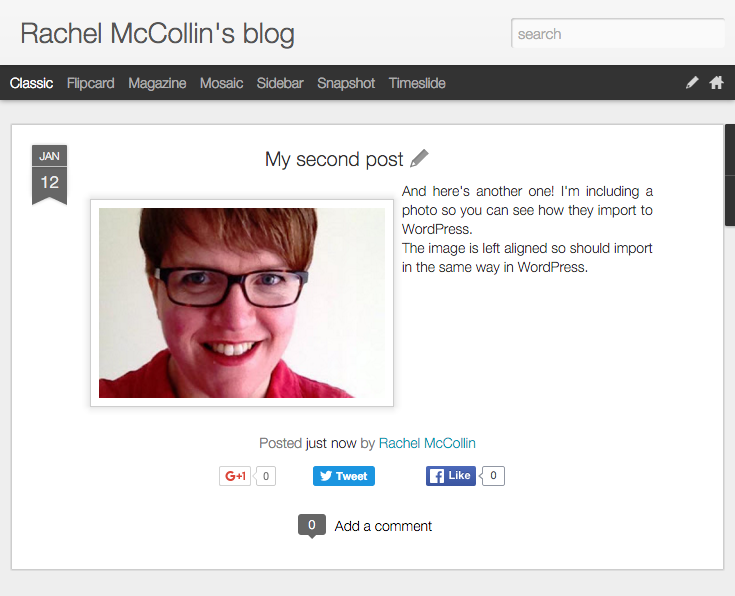 WordPress will get on with importing your posts. 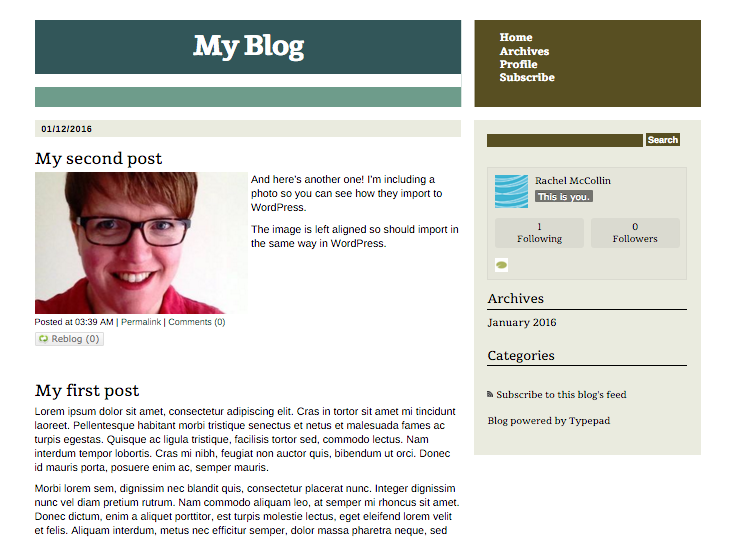 My successfully important TypePad site now in WordPress. It’s successfully imported both of my posts and the image has its alignment set up correctly. However the image hasn’t been imported as a new media file in my new site: instead, the image is showing up using a link to my old TypePad site. You’ll need to replace this with a newly uploaded image in your new site, as it’s not a good idea to rely on a site you’re no longer maintaining for your images. 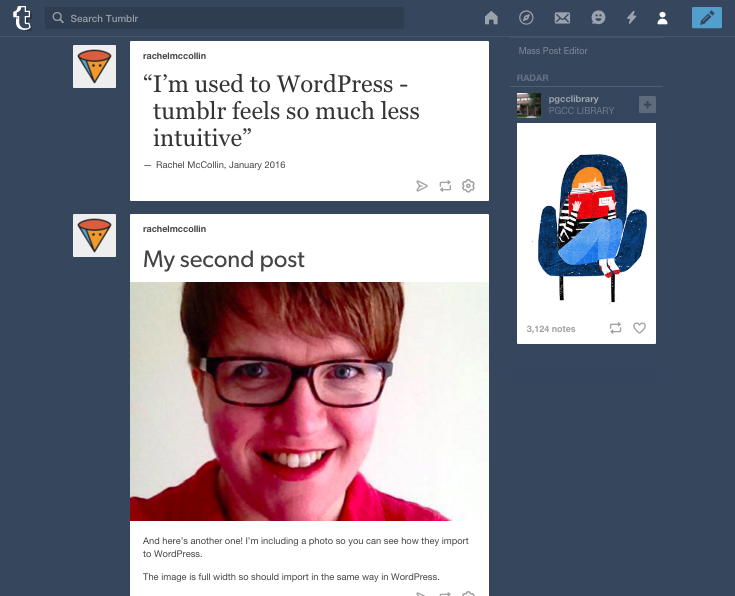 Tumblr is slightly different from the other platforms. It’s designed to work with different post formats, which equate to post formats in WordPress. 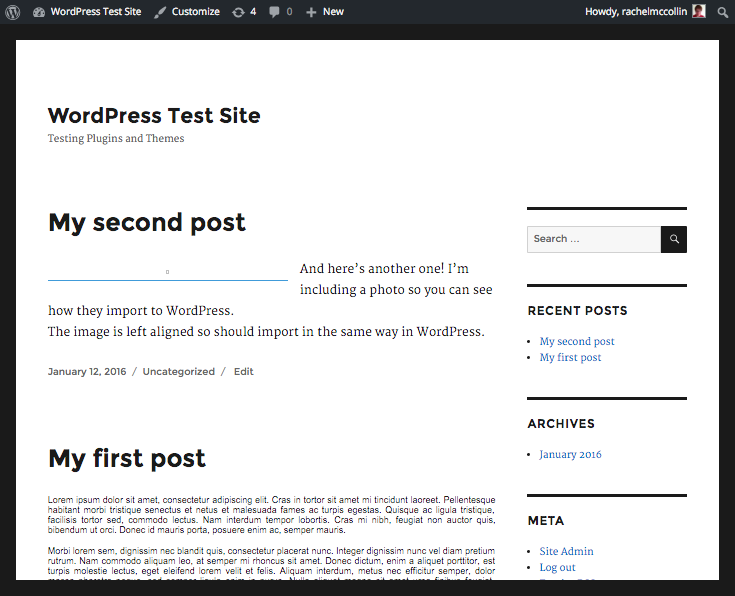 When you import a Tumblr blog to WordPress, your posts will have the equivalent post formats in your new WordPress site. 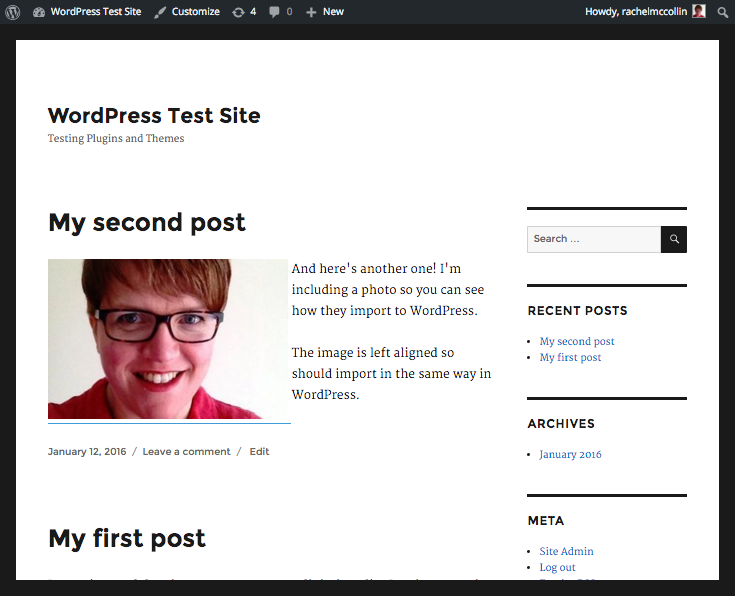 When you import a Tumblr blog to WordPress, your posts will have the equivalent post formats in your new WordPress site. I’ve set up a dummy Tumblr site with a couple types of content in it and will import that. Let’s start by creating the application. You’ll need to register a new application in Tumblr before you can start exporting your content. Tick the I’m not a robot checkbox and click the Register button. Tumblr will provide you with an OAuth key and a secret key (which you can view by clicking the Show secret key link). Make a note of these or keep this window open while you start the import to WordPress. Click on Install Now, then on the Activate Plugin & Run Importer link. Add in your oauth and secret keys. 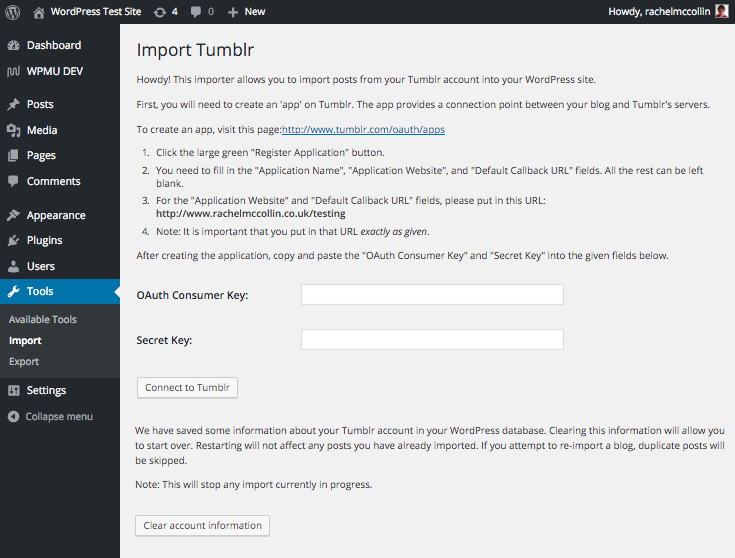 Copy your OAuth and secret keys from the application you already created in Tumblr. Click the Connect to Tumblr button. 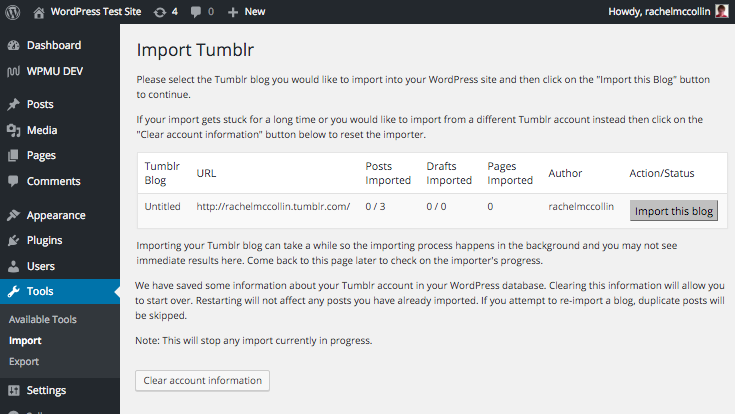 WordPress will connect to Tumblr and show you a screen to tell you this has worked, To continue the import, click the Authorize the Application button, followed by the Allow button when you see the next prompt. Click the Import this blog button. When the import is complete you’ll see a Finished! notification where the Import this blog button was. My WordPress site imported from Tumblr. The import went nicely. My posts have imported as normal posts and the quote has imported as a post with the Quote post format. But once again the image hasn’t imported properly, instead it’s showing up using a link to my old Tumblr site. You’ll need to replace this with a new uploaded image in your new site, as it’s not a good idea to rely on a site you’re no longer maintaining for your images. Using the export tool is a simple way to export the content from your old site to a new one without having to worry about moving databases. 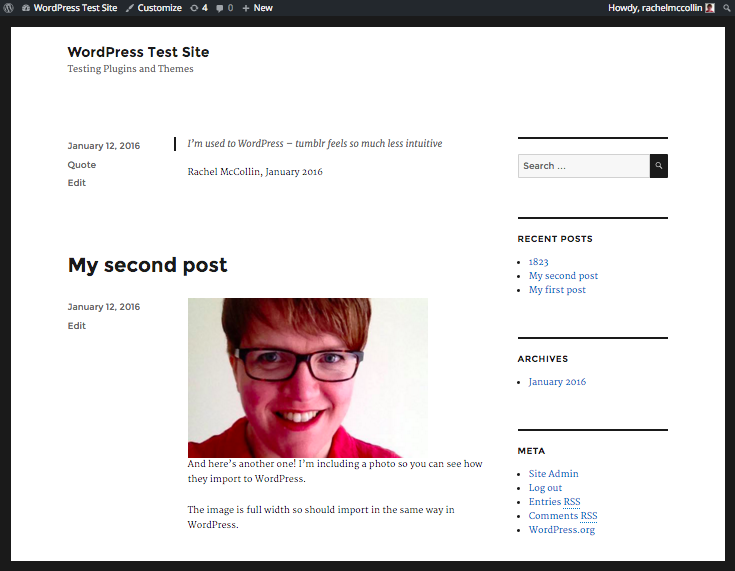 If you’re moving from wordpress.com to a self-hosted site, this is the way to do it. It will export all of your content types, including posts, pages, images and any custom post types you’ve got on your site. However, it won’t import your widgets and site settings. Note: If you want to import widgets from an old site, use the Widget Importer & Exporter plugin, which you’ll need to install on both sites. Make sure you install and activate any plugins that provide widgets on your new site before running the import. First you need to export the content from your old site, which will create an XML file that you’ll download. Select the post types you want to export, or simply select All content to export everything. Click the Download Export File button. Save your export file somewhere on your computer so you can find it again. If your old site has any content in addition to posts, pages and media, you’ll need to make sure your new site has those post types registered before importing your content. Make sure you’ve got all the same plugins installed and activated on your new site. Install and activate the same theme too, as some themes include post types. Check between your old and new sites – the admin menus should look the same, with the same post types and taxonomies available. You’ll need to install the WordPress importer. Click the Install Now button and then the Activate Plugin & Run Importer link. You’ll be prompted to select the XML file to upload. Select the file you already downloaded when exporting from your old site. Click the Upload file and import button. 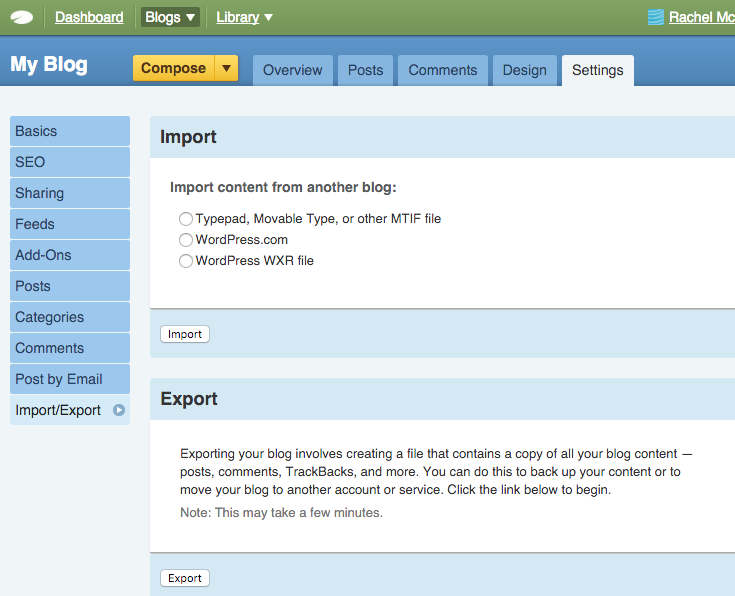 WordPress will import your posts, pages, and any other content types. It will also import the images from your old site to your new one, as items in your media library. Hopefully, this post has helped you to prepare for moving your old site to WordPress from an alternative blogging platform or an old WordPress site. The automated tools that WordPress provides make this process really quick and easy. The only thing you need to be aware of is that the tools just import code. Apart from the WordPress importer, they don’t import images to your new site but display them using links to your old site. Once you’ve imported your content you’ll need to replace those images with new ones uploaded to your site. Good luck with your new WordPress site! Have you used any alternative import tools for other platforms? Share your experiences in the comments below. If you have any questions about moving to WordPress, feel free to ask away in the comments, too.